The Philadelphia Auto Processing Facility (PAPF) is a state-of-the-art vehicle processing center for new automobiles and other roll-on/roll-off cargos. PAPF, strategically located in the heart of the US northeast, provides final dealership preparation, which includes accessorizing and detailing prior to final delivery. 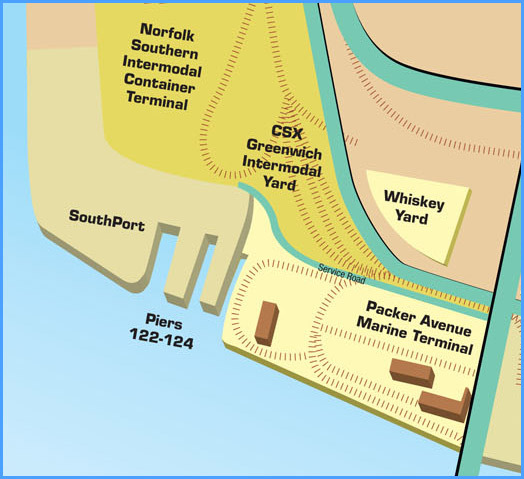 On-terminal access is available by Norfolk Southern and CSX. Follow I-95 North to Exit 17, Broad Street exit. At the second light turn right onto Pattison Avenue. Proceed on Pattison Avenue for about 1/2 mile and it will bend left and turn into Columbus Blvd. Follow Columbus Blvd. (Delaware Ave.) to Oregon Avenue and make a right for Pier 96. Entrance on right – Make a left at Oregon Avenue for Pier 98 Annex. Entrance on Left. Follow I-95 South to Exit 19, Walt Whitman Bridge/Packer Avenue exit. Stay right towards Packer Avenue. At the light turn left onto Front Street. At the first light, turn right onto Oregon Avenue. Proceed on Oregon Avenue for approximately 1/2 mile to Columbus Blvd. (Delaware Ave.) 98 Annex entrance on Right – Cross over Columbus Blvd. (Delaware Ave.) Pier 96 entrance on right side.